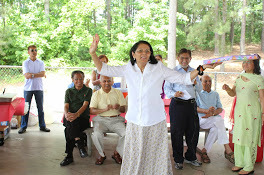 Senior Citizens Program (SCP) Inc organized a joyous Mother’s Day picnic for senior citizens at Best Friend Park Pavilion, Norcross, Georgia, on Sunday, May 25, 2014. The Founding and Executive Director of SCP (Inc) Raj Razdan greeted all present, especially Mothers, with hearty ‘Mother’s Day’ wishes! Seniors did not want to be left behind in felicitating Prime Minister-elect Narendra Modi for his historic and stunning victory in India’s recent elections. Raj invited many of her seniors to share their thoughts on Narendra Modi and bless him with good health to enable him to lead India to its next zenith. Jubilant Rajni Parikh observed that “the media is full of news about Narendra Modi, and his leadership qualities in running Gujarat administration undoubtedly have contributed to his national election victory. It is time to rejoice in his victory and wish him all the best in his role as India’s Prime Minister.” He led the audience in enthusiastically chanting, “Har har Modi, ghar ghar Modi” and also reminded all to watch Modi’s swearing-in ceremony the next day. Atlanta’s ghazal and shairi singer and fellow senior Ujjagar Singh Wassan emceed the program. Paying tribute to mothers, Wassan added that on May 16, immediately after his election victory, even Modi, who has a deep love and respect for his mother Heeraben, went to seek her blessings. Ajit Dave, Nanubhai Parekh, and a few other seniors shared a few Modi jokes while volunteers went around serving delectable snacks. Poetess Kusum Sinha, a familiar face at senior citizen programs, regaled the audience with a thoughtful poem about mothers. As it was Mother’s Day, the Fashion Parade participants were restricted to women only, as fathers clapped with moral support. Brave and talented mothers clad in colorful traditional Indian outfits or Western casuals assembled in a line to compete and be judged by predesignated judges. Contestants were asked to take a brief walk, step up to the judges, and display their talent. The Fashion Parade elicited a lot of fun, mirth, and applause as many ladies mustered up courage, strutted boldly to face the tough judges (and their amused spouses) and to display their hidden talents. Move over famous pageant queens Sushmita Sen, Aishwarya Rai, et al. You now have competition from Georgia! Volunteers did not want to be left behind! So Raj, Shashi Sidhaye, Isha Goyal, and Chinti Bali also got on the dance floor while the judges tallied the scores for the fashion-show brave hearts. After much deliberation, the judges declared three winners: Dr. Rekha Desai (Second runner-up), Geeta Patel (First runner-up), and Meena Patel (Winner). Amidst loud applause, the three winners were presented with their prizes. In a display of humility, Dr. Rekha Desai turned around and presented her own gift to Kanta ben for her participation at the senior events in spite of being handicapped. Then it was time to test the muscle and the quick reaction of the brain to music: a game of musical chairs. Over sixteen energetic women got up to compete. The audience clapped as Harshad bhai Shah, a volunteer in charge of the music system, played music. Slowly the number of chairs and contestants dropped and finally two winners Bhanuben Joshi and Datta Bosamia survived the test and claimed their coveted prizes. Mr. Vinod Karia, the official photographer for the SCP, as usual stood behind the lens and captured memorable pictures of the seniors. SCP volunteer Isha Goyal, an experienced caregiver, gave a few healthy life-style and safety tips. She advised seniors to wear comfortable but loose fitting dresses with elastic bands, which can be removed easily in times of emergencies. She also advised seniors to not lock bathroom or bedroom doors while showering or sleeping so that help can be easily provided in case of sudden strokes or heart attacks or health-related emergencies. She asked seniors to use a portable arm and leg mini exercise machine with LCD monitor to improve cardiovascular function and blood circulation, and even demonstrated how to use the machine. Last but not the least; she stressed the importance of taking medicines and the effective ways to take medicines. Raj Razdan recognized and thanked the sponsors of the picnic, Drs. Jayprakash and Rekha Desai, their daughter Pankti and son-in-law Jay, along with their children. The Desais have been consistent annual sponsors of SCP events for over 17 years. Razdan also recognized SCP volunteers Arunaben Patel, Minesh Mody, Shashi Sidhaye, Isha Goyal, Chinti Bali, and many others for their commitment and devotion in service of and empowering the elders of the Georgia community. Dr. Jayprakash and Dr. Rekha Desai presented the volunteers with orchid corsages for Mother’s Day. Dr. Desai noted that his inspiration to get involved as SCP’s annual sponsor came from his own mother, who was a member of this organization. SCP aims to empower seniors. It provides a forum for camaraderie and the exchange of knowledge. Monthly events include picnics, movie shows, celebrations of Valentine’s Day, Mother’s Day, Father’s Day, India’s Independence Day, religious events like Mata ki Chowki, etc.